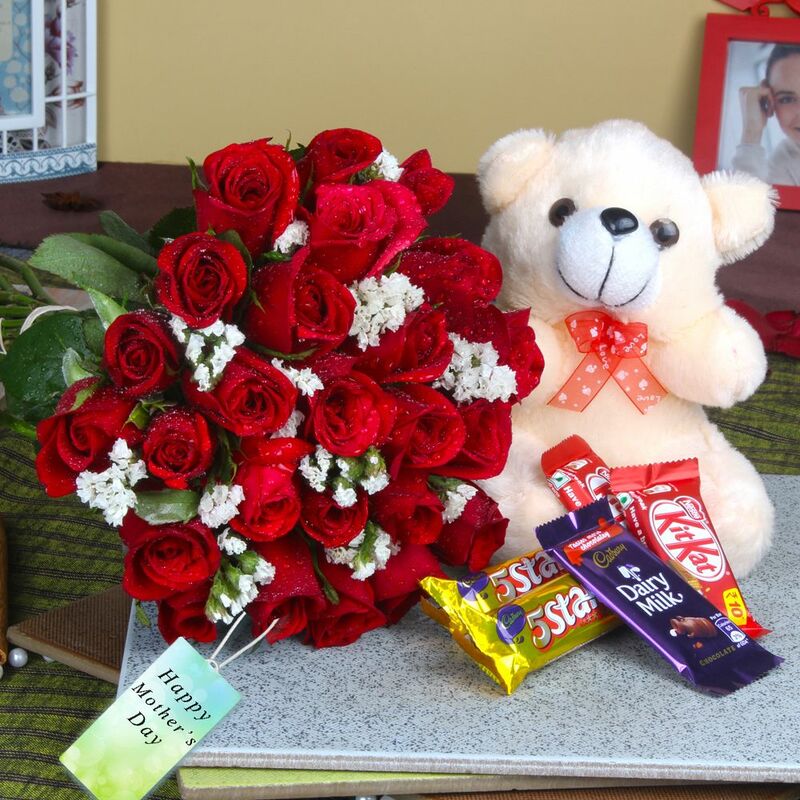 Product Consist : 25 Red Roses Bouquet, 12 Inch Teddy Bear along with 5 Bars of Assorted Chocolates. Mother' Day is celebrated every year to honour and respect a mother. The flower is a pure and beautiful creation of Nature. Best Nature presentable gift is Cute Teddy and Chocolates with Fresh Roses for Mothers Day to the beautiful lady, because of its beauty and purity would surely express our feelings easily as compare to words. Flowers have long been associated with motherhood so it makes a popular choice for Mother's Day Gifting. In this gift set mom gets a cute love with some delicious sweet munch so send these products let her pamper herself to her heart' content, all courtesy of you. This day is very important for all chidrens as the Love for moher can't be define in a word or in a sentence it is only observed while sending these types of special gifts. Check out our Mother's Day Gift shop that will help you to choose the best gift for your loved ones. If you are looking for some exotic Mother's Day Hampers like Cute Teddy and Chocolates with Fresh Roses for Mothers Day, then head to Giftacrossindia.com the largest variety gifting store of India. Product Includes : 25 Red Roses Bouquet, 12 Inch Teddy Bear along with 5 Bars of Assorted Chocolates.